Special 4-4 is the fourth level of Special 4 in Super Mario 3D Land. It is based off World 1-3. At the start of the level, the player is dropped onto a Goomba before dropping down from the stone platform that they start on and going onto some wooden platforms, where they must defeat Goombas to get + Clocks. The player then uses a Switchboard to proceed to the next area. In the next area, the player must defeat some Goombas on some stone platforms before going onto some wooden platforms, where they can defeat another Goomba before using some cloud platforms to go to a small stone platform that they must drop from and land on another stone platform. 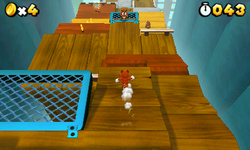 The player then uses a Switchboard that leads to some wooden blocks that lead to the Goal Pole. Star Medal 1: Located where the Mystery Box was located in World 1-3.